Milk from 100% grass-fed cows has higher levels of beneficial fatty acids than conventional and even organic milk, according to a study published by an international team of scientists in the journal Food Science and Nutrition. The research follows up on data published in 2013, which compared only conventional and organic milk, finding organic milk contained 62 percent more omega-3 fatty acids and 25 percent fewer omega-6s. The study compared the composition of several fatty acids within the three types of milk tested (conventional, organic, and grass-fed). Of primary concern was the ratio of omega 6 to omega 3 fatty acids. Although omega 6s are not necessarily bad fats, high amounts or unbalanced ratios of omega-6 to omega-3s has been linked to a range of health problems, from cardiovascular disease, to cancer and other illnesses. High consumption of omega 3s, on the other hand, is linked to reduced risks of a number of diseases, including diabetes, high blood pressure, high cholesterol, cancer, and many other chronic disorders. The diet of early humans maintained a ratio of 1, but modern Western food production, with its focus on processed and hydrogenated fats, has raised that ratio to an average of 15. Looking at over 1,600 milk samples over a 3-year span, results found ratios of omega-6 to omega-3 to be .95 for 100% grassfed milk, 2.28 for organic milk, and 5.77 in conventional milk. While organic milk producers are required to graze their heard for at least 120 days during the growing season, only 30% of their diet is required to come from grass eaten when pastured, with grains intake permitted. The grass-fed milk in the study was defined as requiring 60% of a cow’s diet from pasture feeding, with nongrazing portion coming from forage-based feeds such as clover, grass hay, or alfalfa; grain and silage are not permitted. Conventional dairies have no such requirement, and are often fed silage from genetically engineered grains, which are not allowed in either grass-fed or organic daily operations. The research also found that, given limited fatty acids in the typical Western diet, switching to grass-fed milk could decrease an individual’s omega-6 to omega-3 intake ratio by as much as 8 points and potentially decrease the risk of certain diseases. Although the researchers acknowledge the benefits of fish and shellfish as a major source of beneficial fatty acids, past studies shows the majority of Americans do not consume enough or any oily fish. 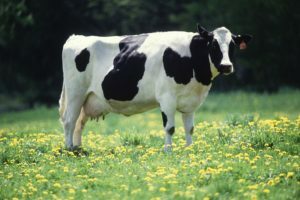 Moreover, grass fed milk can supply certain omega 3s that fish oils cannot, and vice versa, indicating that an all of the above strategy may be best.